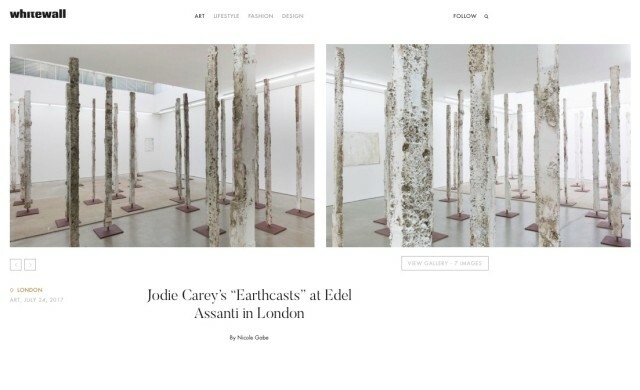 24 July 2017 Jodie Carey’s third exhibition, “Earthcasts,” is on view in London at Edel Assanti gallery. The show of new work includes 50 vertical sculptures, filling the space to feel almost like a forest. Carey’s earthcast sculptures are meant to feel timeless, purposely rendered to human scale. The works are cast in the ground by burying salvaged timber and pulled out to create molds that are then filled with plaster. The resulting organic surfaces are marked by impressions from rocks, roots, and soil. The artist marks the works, as well, by cutting and carving the sculptures, making a more direct connection between nature and the body. The exhibition is on view through August 12. Jodie Carey: Earthcasts on view 23 June through August 12 2017 at Edel Assanti.